CNG: Printed Auction CNG 75. Postumus. Romano-Gallic Emperor, AD 260-269. Æ Double Sestertius (18.55 g, 1h). Mint II (’Irregular mint’). 1st-2nd phase, AD 261-266. Sale: CNG 75, Lot: 1117. Estimate $500. Postumus. 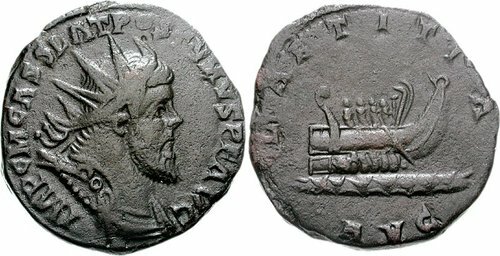 Romano-Gallic Emperor, AD 260-269. Æ Double Sestertius (18.55 g, 1h). Mint II (’Irregular mint’). 1st-2nd phase, AD 261-266. Radiate, draped, and cuirassed bust right / Galley sailing left. RIC V 143; Mairat 480; Bastien, Postume 160; Banti 26. VF, dark brown surfaces. Well struck for issue.